How long does it take before shows go up on BBC iPlayer? ...is the title of the post I was about to publish when I hit refresh on the BBC page for the twentieth time and saw that the new Sherlock just went up. Never mind. 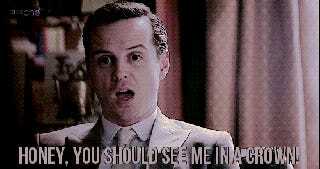 Nothing to see here, except for a completely unrelated Moriarty gif. Carry on with your lives.